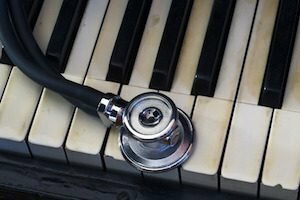 Home » Wondering About the Proven Health Benefits of Playing the Piano? There are many proven health benefits of playing the piano. Numerous studies by the medical and academic communities show the positive effects playing the piano has on humans. As a result, there is a wealth of information out there regarding these benefits. We compiled the top eleven for your enjoyment. 1. Sharpens fine motor skills and improves eye to hand coordination by engaging multiple parts of the brain at once. 2. Develops patience; no piece is perfect on the first try! 3. Increases self-discipline, especially with regularly scheduled practice and lesson time. 4. Builds self-confidence as skill progresses and individuals are willing to share with an audience (even if it’s only the cat). 5. Strengths self-esteem through increasing skill progression. 6. Reduces stress by switching off the body’s “stress response” signal (even if you only play occasionally). 7. Acts as an all year hobby: rain or shine! 8. Improves physical health by increasing the production of Human Heightens release of Growth Hormone (HGH): this slows the adverse effects of aging, reduces heart and respiratory rates, prevents cardiac complications, lowers blood pressure, and increases immune response. 9. Reduces symptoms of dementia, allowing the brain to bypass damaged or blocked neural pathways and retrieve music-related memories. 10. Helps manage feelings of anxiety, loneliness, and depression. 11. Boosts creativity and self-expression. This video does a fantastic job summing up all the great benefits that come from playing the piano. Did you know that children taking regular piano lessons score as much as 35% higher in math and science on SAT scores? Mind. Blown. Ready to Reap the Rewards of Piano? No matter how young or old, rich or poor, so long as people can reach the keys, their piano playing talent will continue to benefit themselves and everyone around them. If you would like to begin piano lessons to gain these benefits for you, contact us at England Piano at (770) 451-1725, and we will get you started!